Beautiful three bedroom with totally private large pool. Located in the lower reaches of Islamlar Village in a very peaceful setting. Two double and one twin bedrooms, all with en-suite bathrooms. 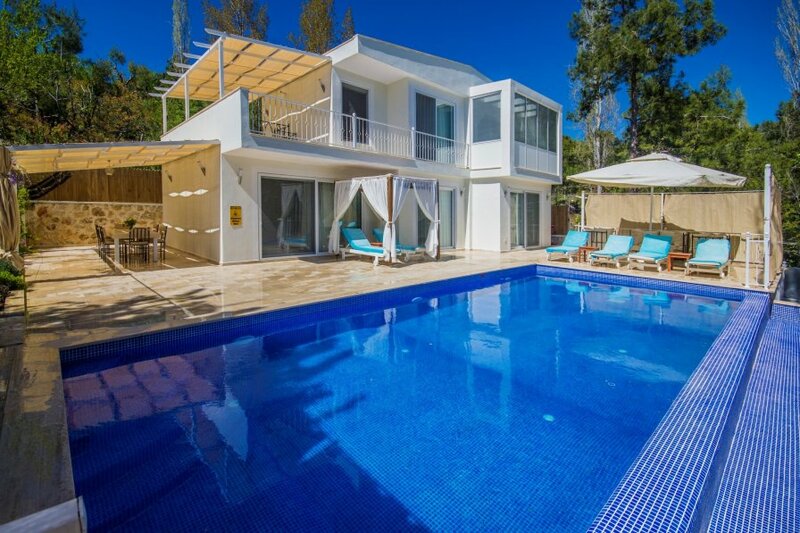 This beautiful luxurious villa is located in the lower reaches of Islamlar Village some 4-5 km from the sophisticated resort town of Kalkan. It has two double and one twin bedrooom, all with en-suite bathrooms, and a capacity for 6 guests. Built in 2016, it has proved to be very popular with both Turkish and European guests alike. The property has been furnished to maximize the enjoyment of its guest holidays - from the large jacuzzi in the master bedroom to the large seating terrace on the upper floor. The tranquillity of the setting, with it pastoral and partial sea views, is truelly enviable. For those guests wishing total privacy around the pool there is a curtain system which can be opened and closed as desired. The ground floor floor accomodation comprises of a beautifully furnished large fully-equipped open plan kitchen, dining area and lounge, which open directly onto the pool terrace. In addition to these areas there is also a double bedroom, (with an en-suite bathroom) and a communal w.c. adjacent to the entrance area. On the upper floor there are two double bedroom with en-suite bathrooms, one with a large jacuzzi. The spacious pool terrace has 6 sunbeds and a large dining area and stone-built BBQ. The pool dimensions are 10 x 5 metres and the depth ranges from 1.1 to 1.6 metres, making this an ideal choice of villa for that guests who are not strong swimmers. The property is fully air-conditioned, has a wi-fi internet connection and private parking spaces adjacent to the villa. The nearest grocers shop, where guests may purchase daily essentials, is some 700-800 metres from the villa.